Pet behavior expert Steve Dale offers some great pet travel advice as we head now into the holiday travel season, it’s a good time to refresh our memories on the basics when it comes to being prepared for all of the ins and outs of safe travel for pets. In this video Steve goes over what you need to do to book a pet friendly hotel, what toys you should bring along, as well as whatever else you need to keep your pet comfortable and happy. Steve also gets expert advice from Dr. Natalie Marks of Blum Animal Hospital in Chicago on how to handle a dog who may suffer from car sickness, which can put a serious dent in your plans. When you travel with pet approved tips like these, everyone in your family will arrive happy. This entry was posted in Pet Travel, Steve Dale and tagged holiday travel tips, pet travel, Steve Dale on November 15, 2012 by Mary Haight. Fall travel with pets is so much more fun that going it alone, sun shining on colorful leaves, crunching and flying as your dog goes for that long toss of the ball. There’s something about warm sun and cool temperatures that just beg for an outing, maybe a last picnic of the year with your best furry friend, and the un-furry kind too! Carol Bryant of Fidose of Reality stopped by with some interesting news about places she’s been with her dog and even has a surprising recommendation for those who can’t get to the Northeast. You might want to think about taking your Fall trip to see foliage earlier rather than later in October given the extreme weather we’ve had this year. Check your sources, whether its online or your Uncle Buck who lives where you want to go, and remember there are so many more places that are now pet friendly, you don’t need to leave your dog(s) at home! 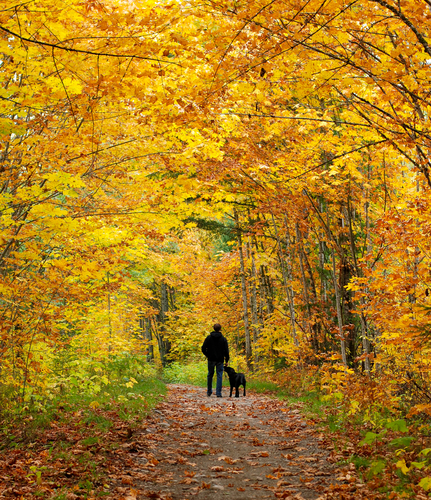 Enjoy your Fall travel with pets! This entry was posted in Mary Haight, Pet Travel and tagged fall travel, pet travel, pet travel podcast on September 24, 2012 by Mary Haight.